Remove the stems from the eggplants and cut into large chunks of about 1 1/2-inch (3-cm). Heat a large heavy pan with about 1/2-inch (1-cm) of cooking olive oil on medium heat. Add in half the eggplant pieces and fry until golden brown. Remove from the oil and set aside. Repeat with the remaining eggplants. The eggplant pieces may soak up the oil, and if so, increase the heat. In the same pan, heat the celery and onion on medium heat until they are soft and shiny. Remove from heat, and add in the aubergine, tomatoes, chopped garlic, red wine vinegar and sugar. Give everything a good stir. Preheat the oven to 320°F/160°C. Transfer everything into a large roasting pan and roast until the tomatoes have softened and are almost disintegrating, about 1 hour. Add the mint leaves, stir everything together, and add salt and pepper to taste. Serve warm on a slice of toast. 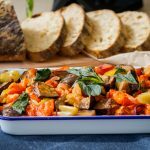 Get this recipe for Brunch Caponata Toast at https://www.theworktop.com/breakfast-brunch-recipes/savory/caponata-toast/.